'Matilda' Brings Beloved Book To Broadway Roald Dahl's beloved children's novel is set to hit the stage as a Broadway musical. The musical's creators say the show skews closer to the beloved book than to Danny DeVito's 1996 movie, leaning more on the original's naughty charm. A couple of days before their Broadway debut as Matilda, Bailey Ryon, Oona Laurence, Sophia Gennusa and Milly Shapiro — all either 9 or 10 — gathered in the lounge of the Shubert Theatre to reflect on the remarkable experience they've shared and sing a bit of their big number, "Naughty." If these four girls have any notion that a $16 million musical is riding on their tiny shoulders, they seem blissfully unaware of it. "Sometimes people say, 'Oh you're going to work,' " says Sophia, a 9-year-old New York City native. "And I'm like, 'It's not work, it's a hobby!' Cuz it's something you like to do, so you don't get really bored of it. And I think that's what made me want to do this." 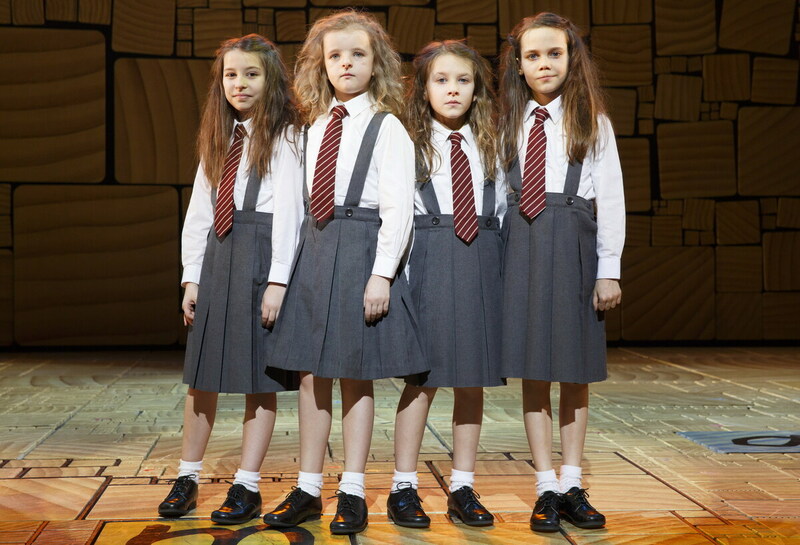 Bailey Ryon, Milly Shapiro, Sophia Gennusa and Oona Laurence share the title role in the show, which got its start as a holiday entertainment at the Royal Shakespeare Company. Director Matthew Warchus says there are very pragmatic reasons for the quadruple casting of the lead role of Matilda — a brilliant little girl who's ignored by her parents and sent to a school run by a tyrannical headmistress, where by sheer force of will (and a little telekinesis) Matilda saves herself, her teacher and her classmates. "It's a very demanding role and can only be played full-on if the girl is fresh," Warchus says. "And so by having the four of them share it through the week, it's always delivered with a level of intensity that wouldn't be possible if it was just one girl." 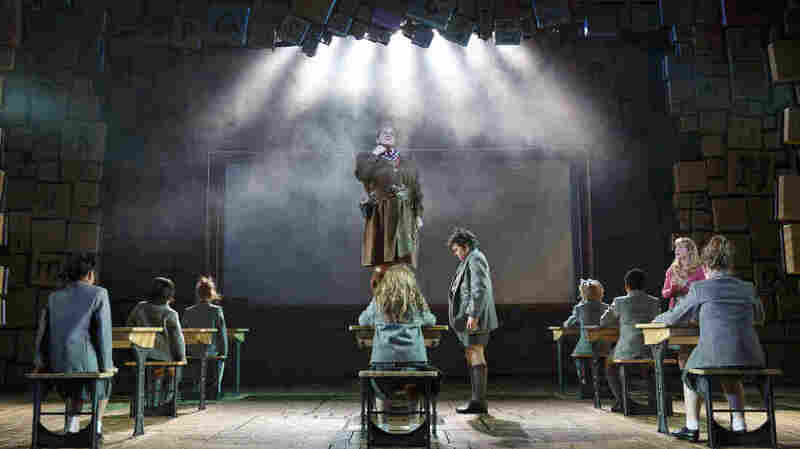 Matilda the Musical had its premiere two years ago at the Royal Shakespeare Company in Stratford-upon-Avon, where it was billed as holiday entertainment. But it was so successful there that the RSC transferred it to London's West End. The show features a script by playwright Dennis Kelly and a score by Australian comedian and musician Tim Minchin. Both are known for some very adult writing, says Kelly. "Asking either one of us, let alone both of us, to adapt a children's book for actual children to see is probably just irresponsible in a way I can't even describe," he says. Minchin, whose cabaret act features profanely funny songs that are unplayable on public radio, agrees. "What I guess the RSC figured is that Dennis is a fantastic storyteller with a great sense of humor, and I'm a sort of rhymy, playful songwriter," Minchin says. "And those were the attributes that, I guess, they took a risk on." There's a great deal of whimsy and satire in Matilda, as well as clever staging that has a cast of adults and children breaking the fourth wall and running through the audience. But the musical also explores the darkness that Roald Dahl was known for. And the biggest repository of darkness in the story is Matilda's archnemesis, Miss Trunchbull, the headmistress of Crunchem Hall. Warchus initially cast women in the role for the show's first two workshops. "But it became clear to me that the sort of monster that Roald Dahl had drawn — and one who is an Olympic-class hammer thrower, as well --[this] hugely strong, intimidating, nasty, repellent, monstrous person, isn't particularly female or male, really," Warchus says. So Miss Trunchbull is played by Bertie Carvel, an actor who's more than 6 feet tall, says Kelly, the librettist. "There was a practical reason as well," he says. "We needed someone who could pick up a child and swing her by the hair!" Ultimately, Warchus says Matilda is a David and Goliath story. "It's sort of about unfairness," he says. "And this is something that children and adults really feel strongly about, I think. It seems like quite a small subject — unfairness, injustice or whatever you want to call it — but, um, kids hate it. They're always saying, 'That's not fair!' and they get enraged by it. And I think that side of us, as adults, never really goes away, actually." Songwriter Minchin says Matilda has been written and staged to appeal to all ages. "You desperately want children to come out absolutely buzzing and having learnt something and having laughed and been invigorated and inspired and having had a great time," he says. "But you also want adults to come out feeling like they've been challenged and having had all those same emotions."